My Citizens of Humanity jeans are one of my favorite pairs and they've only gotten better over time. They are slightly long in length so I've created the perfect cuffed hem and the distressing has that great, worn in look at this point. 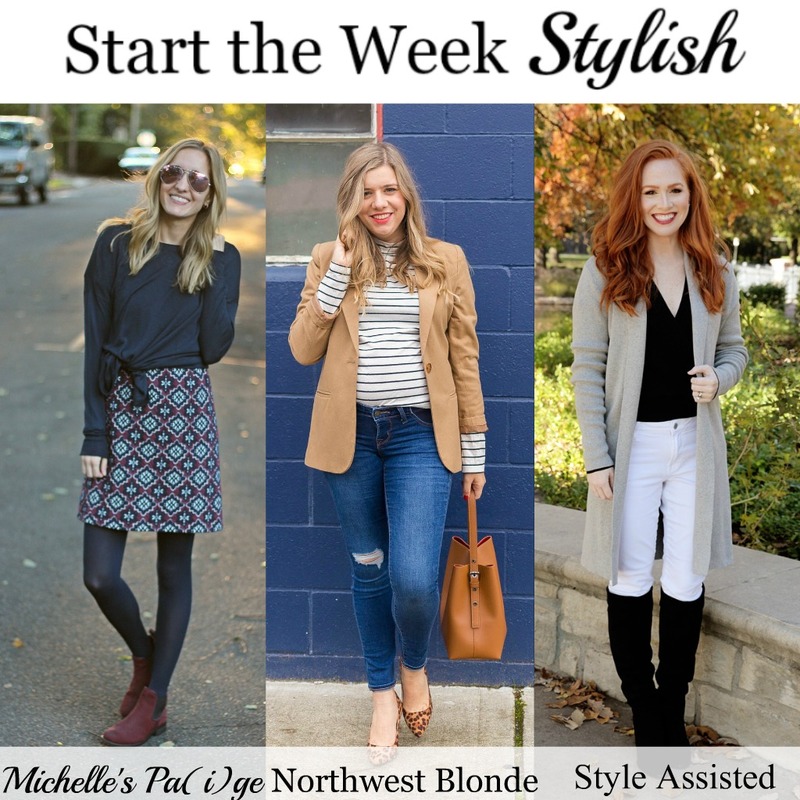 I wear them every season and today wanted to share some outfit inspiration with you all for wearing distressed jeans no matter the season! Pair your jeans with bright sandals & a bright bag. Lean in to that 'May flowers' feeling! Take your spring look one step further for summer! More color, more fun, lots of effortless pieces! Wear fall shades & cozy layers with your jeans for a fall look that stands out from the falling leaves! Bundle up with lots of accessories and jewel tones for winter weather. Now that you've hopefully gained some inspo from me - check out the ladies below to see how they styled distressed pieces! The Magnificent 8 is a collaboration among 8 women from every decade of life showcasing one style. The mission of this collaboration is to show you just how ageless style really is. Wear what you want, when you want, add a smile, and strut your stuff with confidence. Be sure to check out all 8 of these amazing ladies! Wore this outfit last weekend and I think it screams fall. I love the color of this sweater and would you believe I found it at Target for under $25?!? What a steal!! 1. Opt for booties with a heel. It doesn't have to be a high heel; this pair only has a 2 inch chunky heel so they are very comfortable but the heel will elongate your leg! 2. Pair with skinny jeans. Sure, there are other denim styles that look great with booties, but skinny jeans look the best & are the easiest to pair, in my opinion. When the jeans are nice and slim, they allow your shoes to really take center stage! Found this photo on Jody's phone & I love it. Beach days are the best when you’re prepared. Using my goodies from my InfluenceHer Essentials Kit on the beach this summer. Stuck somewhere between wanting summer to last forever & wanting to wear fall outfits! Not crazy about the cold weather already but I am excited about all the fall layers I've been wearing lately. Lots of scarves & jackets & cardigans - those are the obvious layering options - don't forget about layering in out of the box ways, like adding tights or turning your dress into a skirt by adding a sweater on top! Make sure your sweater is fitted or knot it like I did to show off your waist. Classic black tights are a staple in my closet since I love to wear dresses during all seasons, but this time around I opted for a slightly unexpected navy pair to match my outfit! I love how this look turned out. The navy tights are subtle but coordinate perfectly with this printed piece & my booties tie it all together. As with all my tights, this pair is by Berkshire Legwear. They have endless options of hosiery, from classic black tights to colored pairs to prints & don't forget the socks - they have ankle socks all the way to knee high socks with the same huge variety available as the tights. What's your favorite way to layer for fall? PS. Burgundy and navy seems to be a color palette that I wear fall season, after fall season, after fall season. See other ways I've styled these colors here & here. 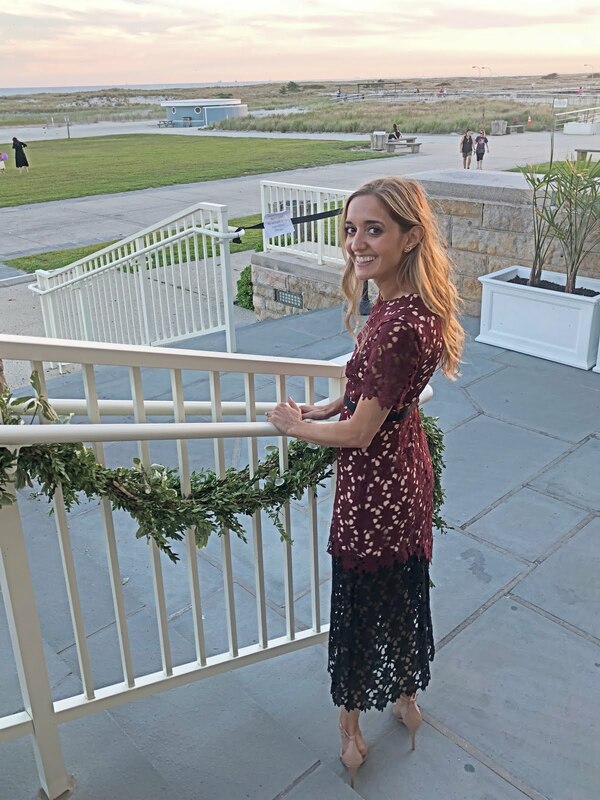 Sharing the outfit I wore to a friend's wedding about a month ago! This wedding was a little more religious than other's that I have attended in the past so I wanted to find a more modest outfit to wear. 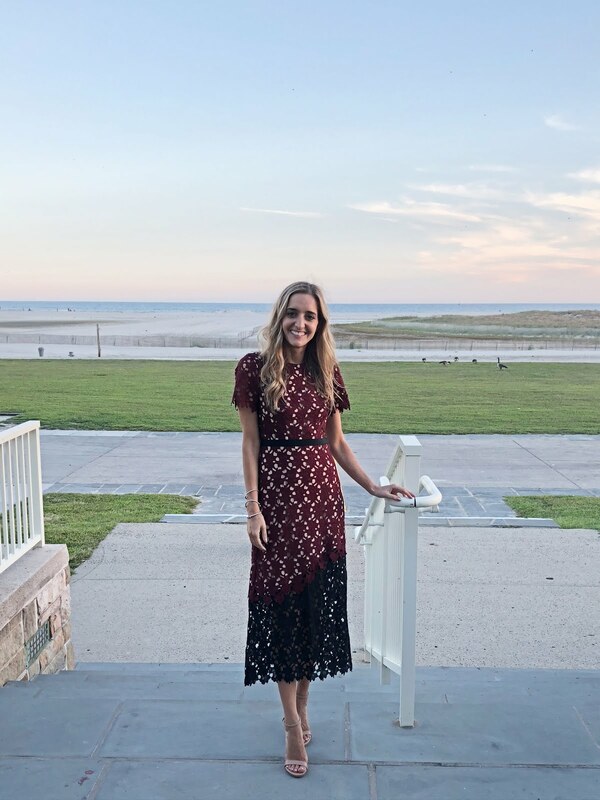 I ordered a few dresses but wasn't really thrilled with any of my options so I decided to try out Rent the Runway for the first time! I was super nervous to order a dress because I had all of the doubts. What if it didn't arrive on time? What if it doesn't fit? What if I ruin the dress while wearing it? I crossed my fingers and ordered this dress. It fit like a glove, AKA perfectly!!! I did a lot of research before choosing to order this dress. 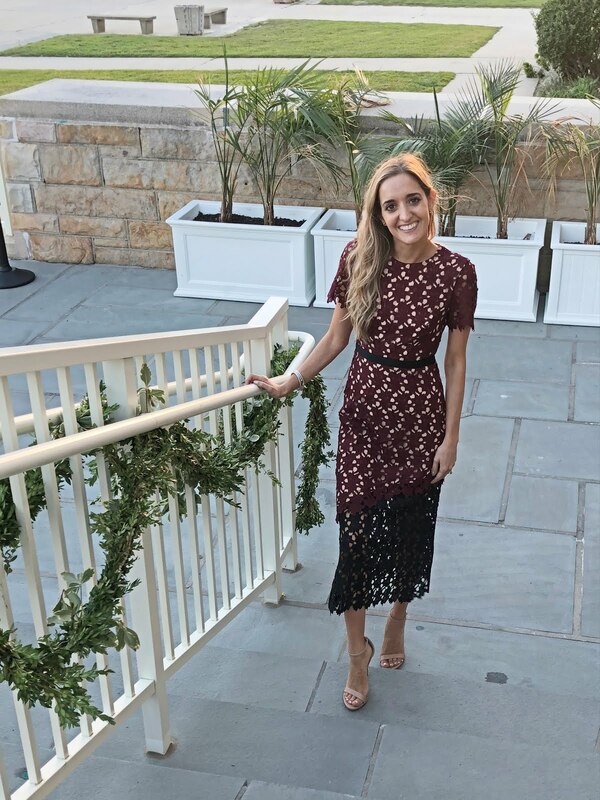 Rent the Runway made navigating their site super easy with lots of ways to filter so you found exactly the dress you were looking for. I told them I was looking for a size 0 wedding guest dress that was knee length or tea length with sleeves and I didn't want to spend more than $100. I was still left with a large selection of dresses to choose from. I kept coming back to this one - it had everything I wanted plus I loved the lace & color. I read a lot of reviews and looked at a bunch of photos of other renters who had similar body types to me and decided to go for it! These photos don't do it justice! I'm obsessed & wish I owned this dress, but was happy to wear it for a special night for a fraction of the price!! Sign up for RTR and get $30 off your first rental! I am so excited to share with you my new favorite pair of COMFORTABLE shoes. In the past, I've talked about ways to make shoes feel more comfortable, but what about just buying a pair that IS comfortable from the first time you slip them on? Hello SAS Shoes! I've been loving the loafer trend since last year but have been skeptical about buying a pair because of the comfort level. Toes scrunched into tight shoes? No thanks. Stiff leather? Nope, especially since I work all day & do plenty of walking in the city. After learning about SAS footwear and reading about the luxury materials that the Linette loafer is made with (premium hardware, genuine leather, elastic on the sides for some stretch & lots of padding on the insole for comfort), I decided to give them a shot! My first day wearing them, I crossed my fingers and wore them to work hoping I wouldn't have to pull out my emergency flip flops half way through the day. 8 hours & a long commute home and I was still in my loafers - these shoes are so comfy you guys & they come in 4 colors so you can choose a pair that fits your personal style! A few other SAS Footwear styles that I want to try: Dazzle - a super cute sandal for next summer, Dylan - the perfect weekend ankle bootie, & Simi - a super cute boot for all your upcoming holiday parties! Have you tried SAS Footwear? Visit their site here to shop! 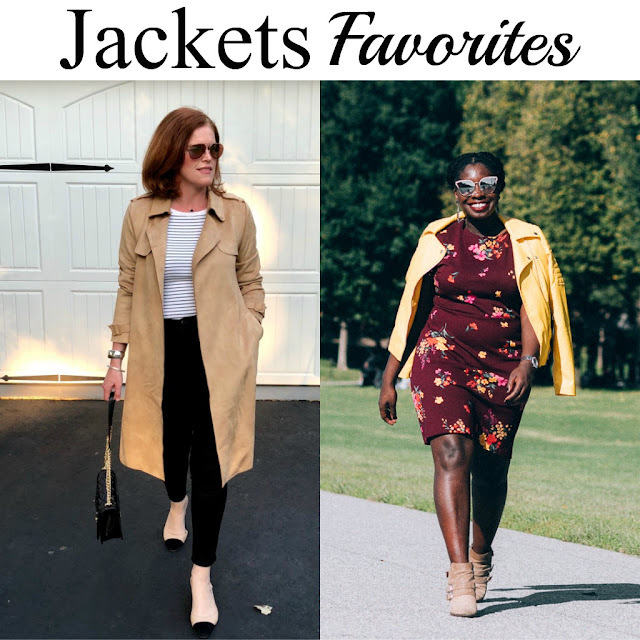 Which fall coat style is your favorite? We spent the weekend out east with friends & it is definitely feeling like fall! I got to wear this outfit this weekend but didn't need a jacket. 60's weather is probably my favorite for getting dressed. I love that I can wear layers & booties but don't need to cover them up with a coat. It's perfect! I got a lot of these pieces during the Nordstrom Anniversary sale this summer but haven't really gotten to wear them yet because of the weather. Plan to see a lot of these booties! I'm obsessed with the wedge heel. Can you believe it's October already?? Time is seriously flying by this year! 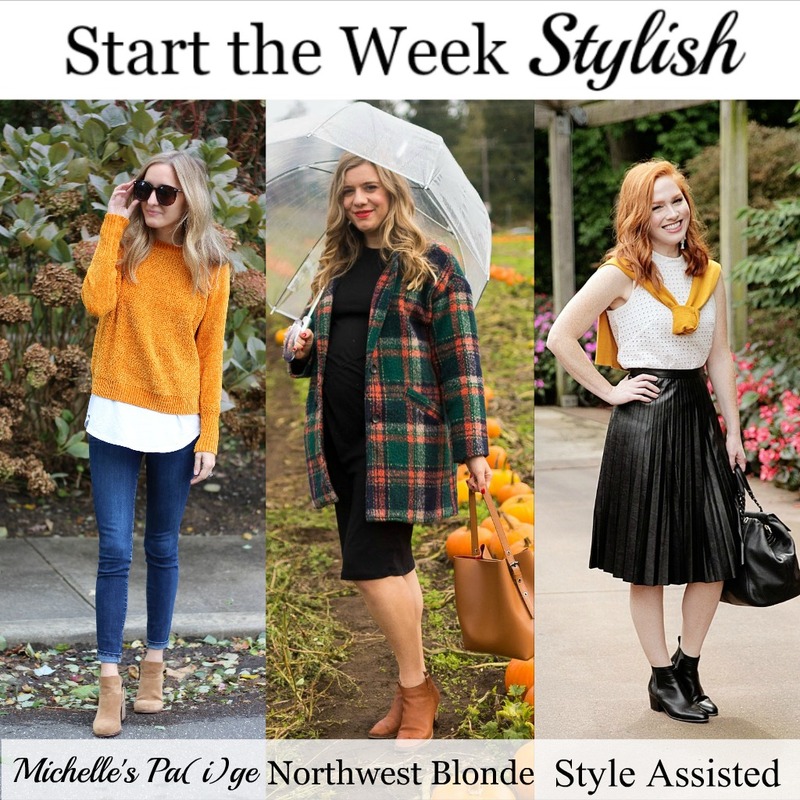 We are into fall now & I have been embracing layers, fall colors & booties already! One thing I am not looking forward to is the dry skin that comes with the colder weather. When it comes to beauty & wellness, it's all connected. Look good, feel good. Eat well, feel well. You get the jist ;). I recently did a haul at Rite Aid, picking up lots of my beauty & wellness essentials; did you know during October, Rite Aid is offering up to $16.50 in coupons for beauty/wellness products? How great is that? Pick up all your products with one stop! While shopping, I decided to pick up NIVEA 48 hour Shea Daily Moisture Lotion & I have to tell you all, I am loving it!! My skin feels so good after applying the lotion & that soft, hydrated feeling lasts! I hate when I have to reapply every couple of hours and with this lotion, I don't have to. The NIVEA body lotions come in 3 different varieties: essentially enriched, Shea daily moisture & aloe vera. I chose to purchase the Shea daily moisture and have been using it after every shower - let me know which formula you plan to try! 1. Manicures & Pedicures. While getting my nails done in the fall/winter months, I always ask them to exfoliate my skin and then slather it in lotion so my hands and feet are left feeling extra soft & smooth. 2. Face Masks. Before our wedding, I became obsessed with using face masks at home at night while I was watching TV or working on my blog. I especially love the brightening and hydrating face sheets - they made such a difference in my skin and overall complexion. How do you combat dry skin during the cooler months?